Our iQUIP 18/10 INOX stainless steel shelving can be mounted fast and tool-free. Thanks to the self-supporting structure, there is no need for diagonal cross braces. This means the shelves are accessible from both sides. 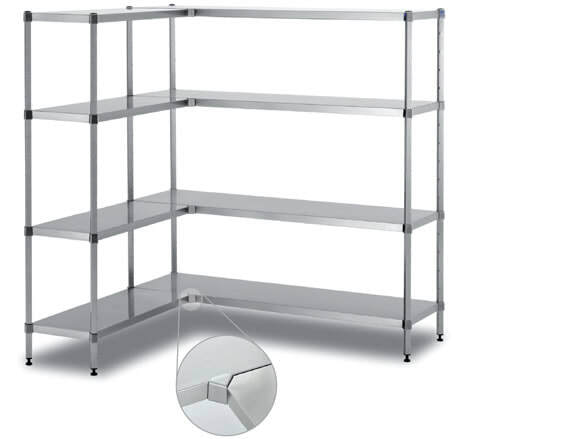 iQUIP INOX shelving can be used to build U- or L-shaped formations without any hindering posts. This is ideal when you want to store items in the corners of the room. You can choose between full shelves and perforated shelves. They are easily height-adjustable every 10 cm without the use of tools (Rapid-Fix System). The shelving posts are equipped with adjustable feet, but it is also possible to put the shelving on wheels to create a mobile version. Every shelving unit has a maximum load of 800 kg. Depending on these shelf dimensions, the maximum load per shelf is between 100 and 200 Kg per shelf.